Buttons in this section have a touch of transparency: they can be completely transparent or translucent. The button packs that appear in this section include transparent and non-transparent buttons in their content. Product Description: Decorative button with the shape of a yellow apple. It is a bit transparent. To be used in scrapbooking, card making, crafts, patchwork and general sewing projects.Content: Price is per unit.Diameter: 19 mm.Material: Plastic. Product Description: Transparent button with a round shape, two holes, with a yellow butterfly design. To be used in clothing as well as scrapbooking, patchwork and other craft projects. Content: Price is per unit. Diameter: 15 mm. Material: Plastic. Product Description: Transparent button with a green print.Price is per unit.Material: Plastic.Diameter: 12 mm. Product Description: Transparent button with an orange print. Price is per unit. Material: Plastic. Diameter: 12 mm. Product Description: Transparent button with a hot pink print.Price is per unit.Material: Plastic.Diameter: 12 mm. Product Description: Buttons (transparent) with the shape of balloons in many colors.Content: 7 buttons of the same model in different colors. There can be color variations in the packing when compared to the picture.Diameter: 30 mm approx.Material: Plastic. Product Description: Round classic button (transparent), with two holes, in yellow color. Diameter: 18 mm Content: Price is per unit. Material: Plastic. 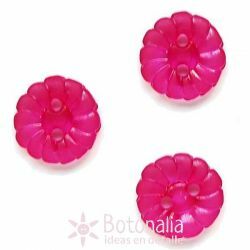 Product Description: Button with the shape a transparent rose and a touch in a golden color in los petals. Perfect for garments and for craft and sewing projects.Content: Price is per unit.Diameter: approx. 13 mm.Material: Plastic (transparent). Product Description: Button with a shank in a polished cabochon style, transparent, in a blue shade. Content: The price shown is per unit. Diameter: 12 mm. Material: Plastic.